I’ve been waiting a long time to tell folks about this. I decided I’d announce it when I had a cover to show off. And, well, here it is. 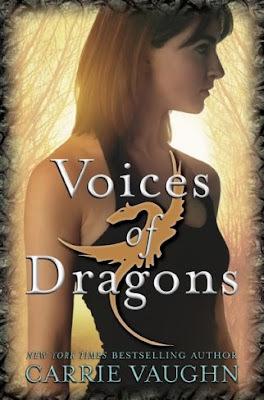 Meet Voices of Dragons, my first young adult novel, previously discussed as the rock climbing jet fighters alternate history dragon book. Pretty cool, huh? I didn’t think I was going to write a YA book. I tried writing it as an adult book, but it wasn’t working. Then I made the main character a teenager, and the plot fell together due to various reasons I don’t want to go into because they’re spoilers. Ta da, a YA novel. Then Harper wanted to publish it. How cool is that? All these UF/PR authors are writing YA! Isn't it marvelous? You always have the best soon to be released book posts. Extremely hot cover, new YA, I love it! I didn't know Carrie Vaughn was going to do a YA. KB sorry I missed your post. Vacation is making me lazy. It sure does seem that a lot of my fav UF writers are doing YA which is fine by me. I haven't had any real disappointments yet. It just gives us more choices. Dottie I love the Kitty series so I am expecting something pretty interesting. This is one of the best stories I've read in a long time. The premise is thoughtful, and the actions of the characters seems logical and heartfelt. I cherished this story, and will keep it as one of my go-to stories. Learn more on best Christmas Images . Learn more on New Years day 2019. Learn more on New Year animated Gifs 2019. Learn more on New Year Images free download. Learn more on Happy New Year HD Images 2019. Learn more on Happy New Year wishes 2019. Learn more on Oscar nomination 2019 date.